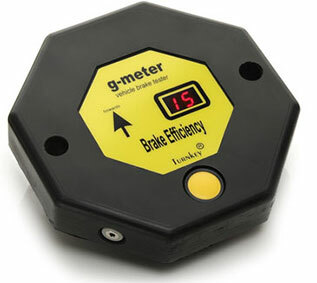 The g-meter is one of our most popular and most straightforward brake testers. DVSA certified, the g-meter it is the ideal choice for garages and MOT test centres and was originally designed for carrying out statutory annual MOT brake performance testing. It is also TÜV Rheinland certified. Suitable for the MOT brake testing of all classes of vehicles (Class III, IV, V, VI & VII vehicles in accordance with the Motor (Tests) Regulations 1981, as amended) the g-meter is practical, reliable and straightforward to use. It can also be used for testing heavy goods vehicles (HGVs) in accordance with the Goods Vehicles (Plating and Testing) Regulations 1988, as amended. Small, lightweight and self-aligning, it will automatically detect the vehicle’s direction of travel. This makes it quick and easy to use, as it doesn’t need to be accurately aligned – ideal if testing large volumes of vehicles in a test centre. The g-meter measures peak and mean acceleration, as well as stopping time and calculating the stopping distance. Braking efficiency can be measured in %g or in m/s2. The test reading is shown on a bright LED display. It is clear and easy to read, even in bright sunlight. It also retains the results of the most recent test in its memory. This data will be retained even if the instrument is turned off and will display until it is used to carry out a new test. If you would like to record more than one set of test data on the device, take a look at our g-meter+.